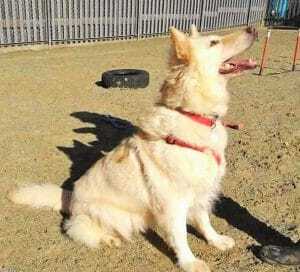 Stunning girl Sandy is a 10 year old cream coloured German Shepherd in the care of RSPCA South Godstone in Surrey. She’s looking for a loving home as her previous owner was unable to keep her. 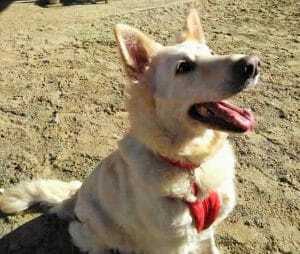 She is a lovely and gentle girl who deserves lots of love and attention. Unfortunately Sandy spent most of her life shut away in a small kitchen. As a result she finds life outside the home environment overwhelming and stressful. She will be better suited to an experienced person who is familar with the breed. Sandy is searching for a special someone who can be with her for most of the day or make arrangements for someone to keep her company while her adopter is out. Sandy will need to be the only dog in the home as she can be anxious around other dogs due to the sheltered life she’s led. 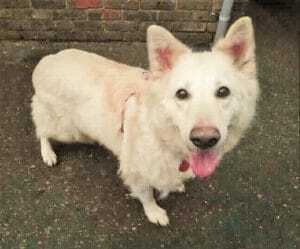 This beautiful lady would like a quiet home and could live with secondary school aged children. Sandy adores affection and will no doubt bond closely with her next owners. She hasn’t shown much interest in toys but enjoys activity feeders and gentle walks. She is very well behaved when being bathed and groomed. She had a lipoma removed when she was spayed. She previously had a skin allergy and is currently on treatment to help with this along with ear treatment. She has a bit of arthritis in hind legs. The niggles of later life! 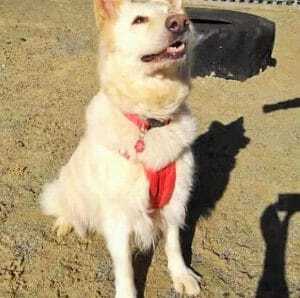 Sandy takes life at her own pace and enjoys gentle walks or a wander around off lead in an enclosure. She is desperate to find a forever home where she can get all the love and attention she craves. Please say you saw Sandy on the Oldies Club website.